Our hydro scheme at Killington Reservoir was officially launched by the Hon Tim Farron MP on 4 January and was a fitting celebration of several years of hard work by everyone involved in making it a reality. 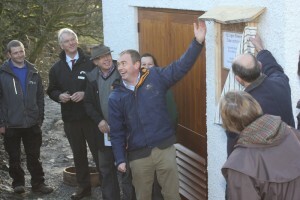 There was a great sense of occasion as Mr Farron unveiled a plaque at the hydro plant room and declared this fantastic scheme open. The deputy leader of South Lakeland District Council, Cllr Sue Sanderson, was also among the special guests. The council supported the hydro project and launch, along with other projects that our friends at CAfS have helped deliver in the area. We were really pleased that several of the local contractors who’d worked on the hydro were able to come, along with representatives from the Canal & River Trust, who manage the reservoir, and the Lake District National Park Authority, who have a CEC solar array on their roof.